Heavy rains and blocked storm drains maroon two cars: mine in the background! The photo makes it look brighter than it actually was! Exposure info: 1/40 sec., f/4.5, ISO 1600. Heavy storms again swept (and are sweeping again right now) the area. I was at work when the first wave of the evening hit. The wind roared, the rain poured, hail rattled, and tree leaves were torn and scattered … and therein was the problem. In our parking lot the storm drains became blocked by fresh, green, shredded leaves and the torrential rains backed up. The parking lot I had chosen earlier in the day flooded for the first time ever. I was lucky for I’d chosen high ground. Had I parked in my first choice of spots, I might be telling a less fortunate story. Someone else parked in the spot I might have taken and water lapped to within about two inches of their car doors’ lower edges! Due to a staffer’s heroic effort the storm drain was cleared and the waters subsided. Still, flooding, not wind damage, was the story around the area. I’m sure there will be many stories around the office tomorrow! Oh my! I didn’t realize you were in the storm area. What a close call. I’m so glad you and your vehicle are alright. Tuesday’s storm was kind of scary. Last night’s was just wet… Very Wet for us! We’re just happy we aren’t getting the deadly tornadoes they’ve been getting in Missouri and neighboring states! 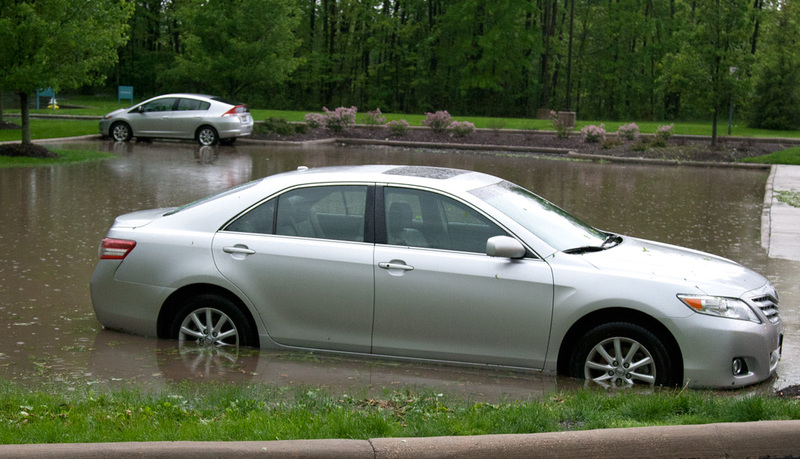 Our library’s back parking lot flooded so the water was over my shoes… which are still wet. We could drive out though and I went home to a bit of water in our basement.